In conjunction with their 50th Anniversary, AR has unveiled a new corporate landing page. The page highlights the four divisions that make up the AR family of companies – AR RF/Microwave Instrumentation, AR Modular RF, SunAR RF Motion, AR Europe – and serves as a launching page to each of the four companies. AR RF/Microwave Instrumentation is the world-class source for Broadband High Power, Solid State, RF Amplifiers and Microwave Amplifiers; TWT Amplifiers; Log Periodic Antennas and High-Gain Horn Antennas; and EMC Test Equipment. AR Modular RF is a global leader in Broadband, Sub-Band and discrete frequency non-EMC RF amplifiers and amplifier systems. Its products are used in military communications, electronic warfare, homeland security, high-tech medical equipment, and more. 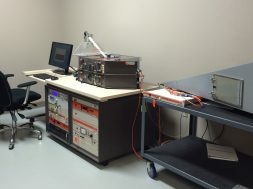 SunAR RF Motion, formerly known as Sunol Sciences Corporation, has earned a reputation as a high-quality manufacturer of Positioning Equipment and Antennas for EMC and Wireless Testing. AR Europe offers a complete line of RF Products, Testing Solutions, and services to the entire European market. For more information, contact AR RF/Microwave Instrumentation, 160 School House Rd. Souderton, PA 18964 at 215-723-8181 or at www.arworld.us. For an applications engineer, call 800-933-8181.